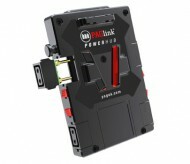 PAGlink is the world’s first system of intelligent linking batteries, chargers and accessories. It has been designed to power the wide range of cameras used for broadcast acquisition, video production and digital cinematography. PAGlink is the only system that allows you to combine the capacities of two or more batteries on your camera, to achieve super-high capacities and longer run-times. When power is low, but you want to keep running, just add another PAGlink battery of any rated capacity, in any state of charge, and get the shot you need. PAGlink batteries can also be hot-swapped for continuous power. PAGlink batteries have the ability to sustain high-current loads of up to 12A, when linked, providing more power for cameras and multiple accessories than any other system. PAGlink batteries are smaller and lighter with a higher energy density than those of an equivalent capacity offered by other manufacturers. PAGlink offers more efficient linked battery charging - an industry first developed by PAG. 16 batteries can be charged simultaneously on a two-position charger. Linked charging puts an end to midnight battery swapping on location. PAGlink offers outputs to power accessories via a separate, user-configurable PowerHub. 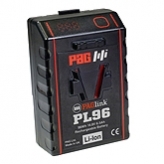 It allows PAG to keep its batteries as compact as possible and enables you to have all the outputs you need. 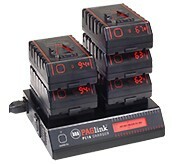 PAGlink is the right battery system for today’s increasingly computerised cameras; it makes other battery systems seem crude by comparison.